Georgian Roped Entryway Set (Satin Nickel Finish) -- large deadbolt entryway system complete with all the hardware. 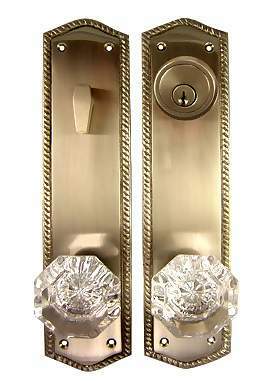 Shown with solid brass (satin nickel finish) with crystal knob. The plate measures 2 1/2 inches by 10 1/2 inches. The entryway set has a center to center distance (knob to deadbolt) of 5 1/2 inches. Single door options comes as shown with two plates. Double door option includes a complete matching double dummy set for the second door. Available in several finishes.